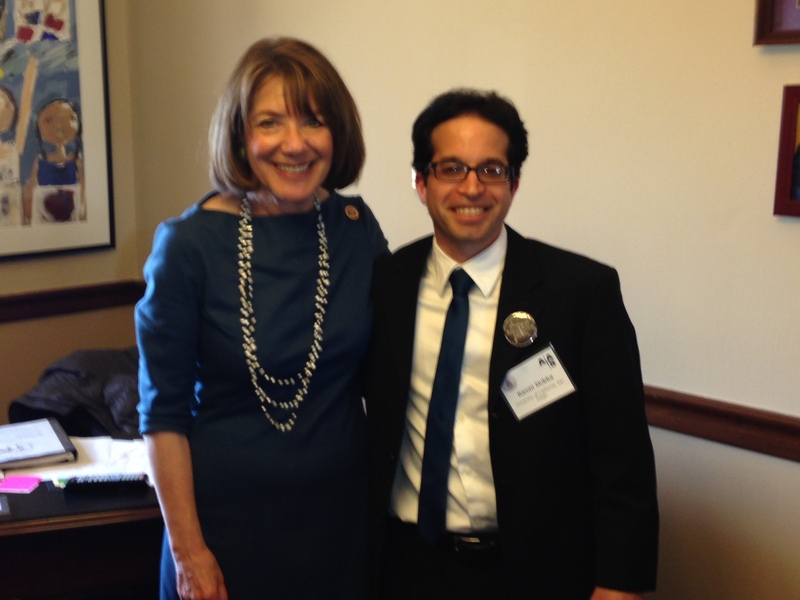 Last week, I participated in the Congressional Visit Day (CVD) with the American Astronomical Society (AAS). 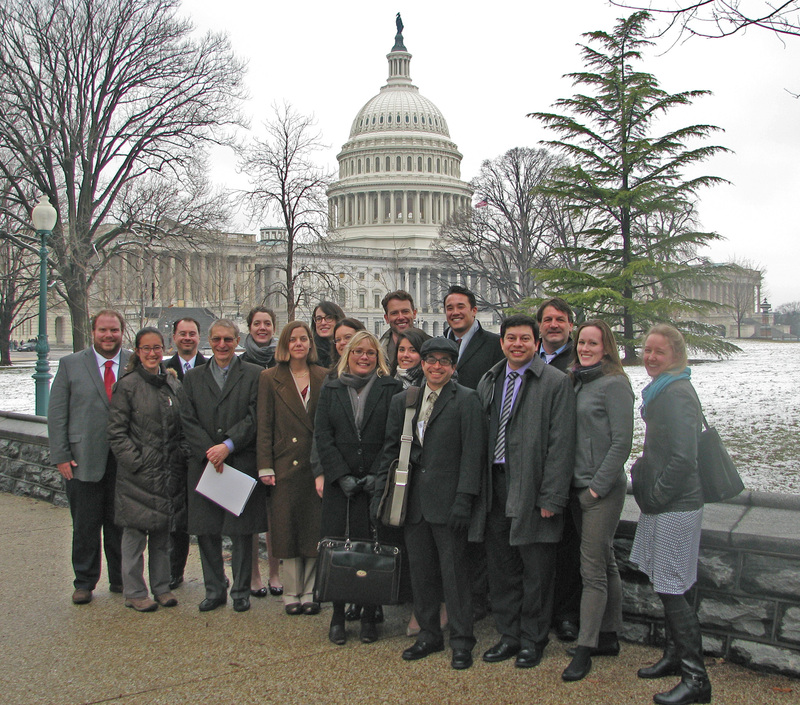 I was just one member in a group of eighteen AAS members—a diverse group from around the country involved in many different subspecialties of astronomical research, as well as various teaching and outreach programs. Below, is a nice photo of us is (and I’m the guy wearing a hat). Our AAS delegation was part of a larger group of scientists, engineers, and business leaders involved in a few dozen organizations participating in the CVD, which was sponsored by the Science-Engineering-Technology Work Group. Go here for a further description of our program. We also told our Congress members about our personal experiences. In my case, I have been funded by NASA grants in the past and am currently funded by a NSF grant. I am applying for additional research grants, but it’s not easy when there is enough funding available only for a small fraction of submitted grant proposals. In the past, I have also benefited from projects and telescopes that were made possible by NASA and the NSF, and I plan to become involved in new telescopes and missions such as the Large Synoptic Survey Telescope (LSST), the Wide-Field InfraRed Survey Telescope (WFIRST), and possibly the James Webb Space Telescope (JWST, the successor to the Hubble Space Telescope). Also, if a NSF grant I’ve submitted is successful (fingers crossed! ), I will be able to participate more actively in public outreach programs especially in the San Diego area in addition to continuing my research. Not only did we explain the importance of stable funding for basic research, we also talked with our legislators about how astronomy is a “gateway science” that draws people in and inspires them to learn more, become more involved, and even potentially become scientists themselves. We talked about the importance of improving science and math literacy, which also improves US competitiveness with respect to other countries, and about how investment in science spurs innovation in industry and leads to new and sometimes unexpected developments in computing, robotics, optics, imaging, radar, you name it. Since “all politics is local,” as they say, we also emphasized that these investments in scientific research are important for strong local, as well as national, economies. As we were visiting shortly after the introduction for the President’s Budget Request (PBR) for FY 2015, we also expressed our concern that the proposed budget reduces funding for NASA’s education and outreach activities within the Science Mission Directorate by two-thirds, and would require mothballing the Stratospheric Observatory For Infrared Astronomy (SOFIA) outside of the well-established senior review process. My Congress members are Senators Barbara Boxer and Dianne Feinstein, whose staff we met, and Representative Susan Davis (CA-53), with whom we met personally (along with a member of her staff). We had a quick photo-op too, right before she had to get back to the House chamber for a vote. I was in a group with two other astronomers who were from Oklahoma and Illinois, and we met with their respective Congress members as well. Our larger group was split into teams of three to four for the days visits, and each met with the representatives and senators of all team members. Senators and Representatives serve on different committees and subcommittees, each with a specific jurisdiction over parts of the federal government. For example, Sen. Boxer is on the Science & Space Subcommittee of Senate’s Commerce Committee and is the chair of the Committee on Environment & Public Works. Sen. Feinstein is chair of the Senate Appropriations Committee’s Subcommittee on Energy & Water, which has jurisdiction over the Department of Energy (among many other things). The appropriations committee is responsible for writing legislation that grants federal agencies the ability to spend money, that is, they appropriate the budgets for the agencies under their jurisdiction. Rep. Davis is a member of the House Education & Workforce Committee and has done a lot of work on educational reform, promoting youth mentoring, and civic education. I think that we received a largely positive responsive from our congressional representatives. My three Congress members were very supportive and in agreement with our message. Some of the other members we met with, while generally positive about our message, left me with the impression that they approved of our “hard sciences” but didn’t want as much funding going to social sciences, climate science, and other particular fields. It seems to me that we must get ourselves out of this highly constrained budget environment, in which discretionary programs like those funding the sciences are capped each year; we need to either find additional sources of revenue (e.g., reducing tax breaks) or make other changes to current law. In my previous blog post, I talked about the proposed budget and the negotiations taking place in Congressional committees. We also need to consider the current political situation with the upcoming mid-term elections. Once a budget (which may be significantly different than the PBR) is passed by the House and Senate Appropriations Committees, it will be considered by the House and Senate, which are currently controlled by Republicans and Democrats (who have 53 seats plus 2 independents who caucus with them). However, it appears possible that Republicans may retake the Senate in the 114th Congress, and in that case their leadership may resist even small additions to the current budget request and may attempt to simply pass a “continuing resolution” instead. On the same day as our CVD (26th March), Office of Science and Technology Policy Director John Holdren appeared before the House Committee on Science, Space, and Technology, where there were considerable disagreements among the committee members about STEM education, SOFIA, and other issues. (Note that the committee is particularly polarized and has been criticized for its excessive partisanship and industry influence.) Fortunately, on the following day, a hearing before House appropriators on the NSF budget request fared better. This is encouraging, but in any case it will be a difficult struggle to produce a good budget (that is, good for science) within a short time-scale. Very nice summary, Ramin! You are an excellent writer. Did Senator Boxer’s or Feinstein’s staff have any comments on the SOFIA program? Or comment on the NASA budget proposal? Sen. Boxer’s and Feinstein’s staff were certainly supportive of maintaining or increasing (if possible) NASA’s budget and NSF’s budget. The President also proposed the “Opportunity, Growth, and Security Initiative”, which would add $56B overall including a 6% increase to NASA’s budget, but unfortunately other Congress members haven’t been very supportive of this proposal. Sen. Boxer’s and Feinstein’s staff might not have been aware of the details about the SOFIA program, and we didn’t discuss it very much. Our stance was that SOFIA shouldn’t have been cancelled outside of our established senior review process, and if SOFIA is restored to the budget, its associated funding should be restored as well. Here’s a brief update, including good news: many House members have signed on to the letters supporting the NSF and DOE Office of Science, including San Diego Reps. Susan Davis and Scott Peters. The letter for NSF funding is currently circulating the Senate.